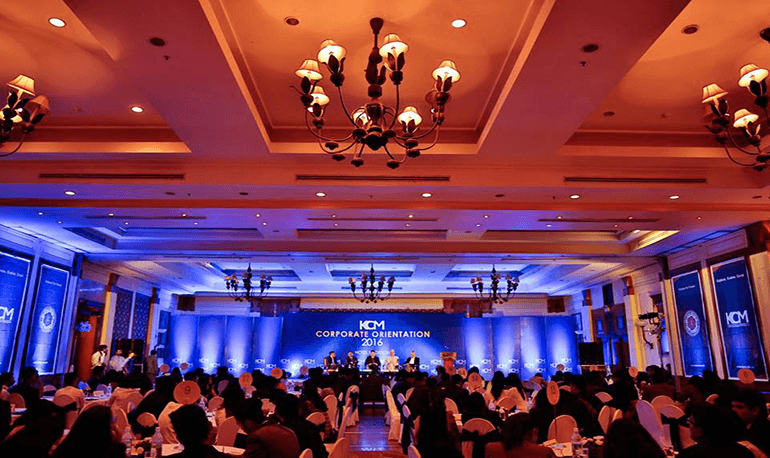 KCM Corporate Orientation 2016 was the second phase of the orientation program which not only provided the students with a glimpse of the corporate world but also inspired them to understand their personal goals better. The program was held at Hotel Radisson (Nepa-Dhuku Hall) on 2nd of August, from 2:00 pm onwards. The first phase of the program consisted of twenty KCM alumni from various industries who interacted with the students on various challenges and opportunities during their KCM life as well as in their professional career.The second phase of the program comprised a panel of five corporate leaders from various sectors who addressed the students on the various challenges and opportunities that lie in their respective fields. They shared their ideas and provided students with motivation and direction.The students were free to put forward their quieries at the end of the session. The first year students shared a platform with the alumni professionals from different organization where they interacted with them and gained knowledge about the industry along with the working mechanism of the corporate world. The session was very fruitful and inspired the newly enrolled students to get a clear idea of the world of management that lies ahead.